A cinematic format is defined by the sensor size, the shape of the frame cropped on that sensor, as well as the type of lenses required (for example anamorphic versus spherical). Cinematographers today have an incredible array of formats to choose from, with a range of image sensors that goes from iPhone to IMAX. Our contemporary cinematic culture is increasingly hybrid, featuring collages of different format sizes and resolutions to achieve different image textures, often in the same movie. Today's filmmakers readily mix film and digital, spherical and anamorphic, intercutting Super 35 with smaller and larger formats. Some cameras, notably the Red Epic, allow you to rapidly switch from one resolution to another by cropping the sensor to different sizes. For example you could choose to shoot the wide shots in 6K and the close-ups in 2K. Some promoters of UHD and 4K cameras go further and cite the ability to "shoot a wide shot and close-up at the same time" -- a dangerous proposition for cinematography, to say the least. In a recent post, I wrote that digital projection has introduced Elastic Frames, enabling filmmakers to easily redefine the frame lines and aspect ratios in the same movie, and even in the same shot -- like Xavier Dolan did in Mommy (shot by André Turpin). In a similar vein, the current prodigal mix of cameras and sensor sizes is introducing filmmaking that uses "Elastic Formats". I foresee future cinema screenings switching between multiple aspect ratios, formats, resolutions, dynamic ranges and speeds. Aesthetically, these multi-textured images would be a sign of our times. Technologically, this would enable the best quality with limited bandwidth. Today's cinematographers have to be able to switch formats easily, sometimes on the same project, and choose the appropriate focal length. The test I shot with cinematographer Pierre-Hugues Galien, AFC, featuring Marion Delahousse and Kevin Felix-Lassa, offers a simple example of switching formats. We shot with a Leica Vario-Elmarit-SL 24-90mm zoom on a Leica SL at f4, and cropped the full-frame sensor to 3 different sizes: 36x20mm (similar to a full-frame 35mm still photograph), 25x14mm (Super 35) and 11.95x6.72mm (Super 16). In one of our tests, we kept the same camera distance and the same field of view around Marion in the foreground, we then varied the focal length to keep the same camera foreground framing for each sensor size. Here's an example comparing Super 35 and Super 16. The optics behind this comparison is pretty simple. The frame is defined by the field of view at a given distance between the sensor and the subject. If you decrease the size of the sensor, you have to shorten the focal length to keep the same field of view. Another way to look at this is to think about focal length and angle of view. A given focal length will always have the same angle of view with a given sensor size. When you switch to a smaller sensor size, the focal length's angle of view gets narrower, and the framing gets tighter, so you have to switch to a shorter focal length with a wider angle of view to keep the same framing. In a way this test is similar to scouting or shooting interiors in a small location: you may find yourself in a corner or up against a wall to get a wide shot. The camera position is limited by the wall. Here, the camera position stays 5’ away from Marion in the foreground, with Kevin about 6’ behind her. We started at the zoom's widest angle of 24mm in Super 16, and then zoomed in to match the framing around Marion, going to 48mm in Super 35, and 67mm in 36x20 (Full Frame 35mm). 1. The most apparent change is that the longer lenses of the larger formats have less depth of field than the wider ones of the smaller formats. This means that there is a dramatic isolation of Marion in the frame as we go to the bigger sensor and a longer focal length. 2. It’s also striking how identical the background compositions look when the camera doesn't move; Kevin and the painting maintain the same size for the three focal lengths. I imagine that we might see more background variation if we had shot at a closer distance to Marion, because the angles of view would be less aligned. 3. This is more subtle. The different focal lengths have different perspectives, the way they render space. A key takeaway from sensor comparisons is that, at the same distance, larger formats require longer lenses for similar compositions. This is one reason many filmmakers compare 35mm anamorphic to 65mm. 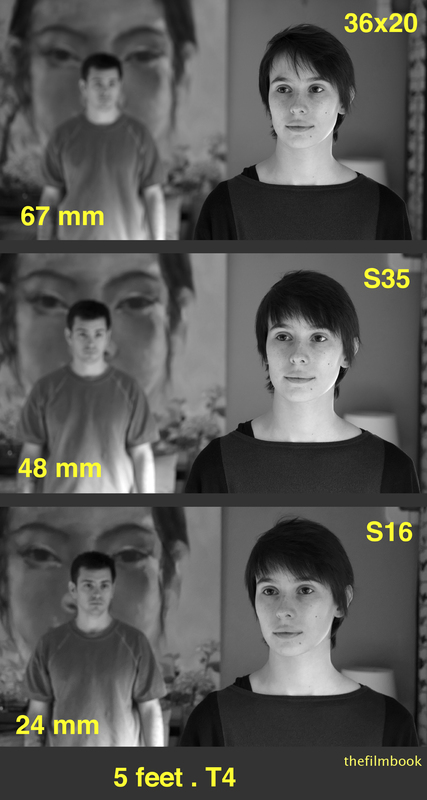 To achieve the same composition at a given distance in 65mm, you need to roughly double the focal length used in Super 35. This is comparable to the doubling of focal length when going from Super 35 spherical to 35mm anamorphic. One question that comes up as you switch sensor sizes is: which focal length will give me the same framing? If you're shooting in Super 35 with a 50mm, which focal length will give you the same frame at the same camera position in Super 16? Or in Full Frame 35mm? Or in 65mm? To address this question of equivalent focal lengths, photographers came up with the crop factor. The crop factor uses Full Frame 35mm (36x24mm) as the reference, and compares all other formats to that. 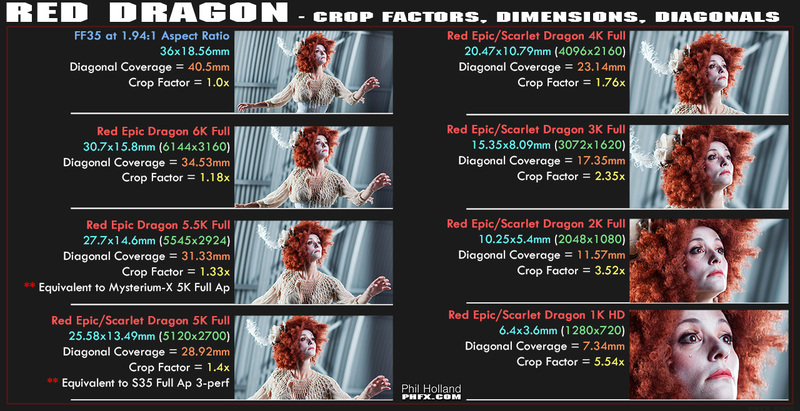 For many cinematographers, it may make more sense to use a movie crop factor, with a motion picture reference instead of a photographic one. If you know how lenses frame in Super 35, then you can estimate how lenses in other formats would translate to Super 35 focal lengths. (divide by two and multiply by three). 3. Super 35 is about half of 65mm. 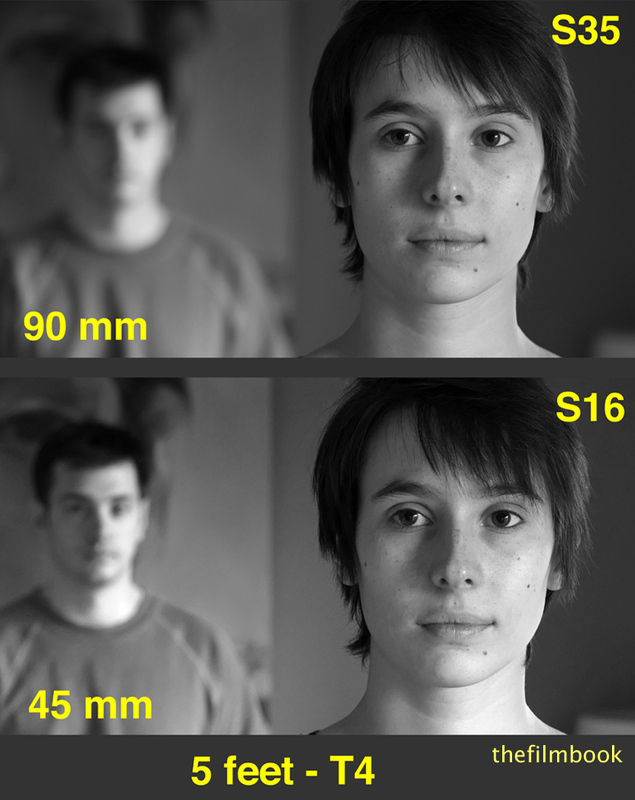 A 21mm in Super 35 is equivalent to a 42mm in 65mm. I like to use sensor widths for crop factors (although you can use diagonals or heights as well). To calculate a crop factor between reference sensor A and another sensor B, simply divide B width by A width. -- What is the equivalent in Full Frame to a 100mm in Super 35? -- What is the equivalent in Super 16 to a 100mm in Super 35?